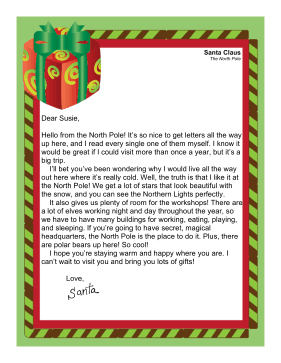 Santa discusses his operations in the North Pole in this letter to curious children. Hello from the North Pole! It's so nice to get letters all the way up here, and I read every single one of them myself. I know it would be great if I could visit more than once a year, but it's a big trip. I'll bet you've been wondering why I would live all the way out here where it's really cold. Well, the truth is that I like it at the North Pole! We get a lot of stars that look beautiful with the snow, and you can see the Northern Lights perfectly. It also gives us plenty of room for the workshops! There are a lot of elves working night and day throughout the year, so we have to have many buildings for working, eating, playing, and sleeping. If you're going to have secret, magical headquarters, the North Pole is the place to do it. Plus, there are polar bears up here! So cool! I hope you're staying warm and happy where you are. I can't wait to visit you and bring you lots of gifts!